You can remove GetWindowText at any time from your Windows computer. Uninstallation is not required for portable applications! 1.) ... GetWindowsText program just delete! 2.) ... GetWindowsText from the Zip folder started? Sea also: ► read the columns for each row in the list view! 1.) GetWindowsText program just delete! Or simply highlight the executable file and press the [Del] Delete Key on the Windows Keyboard! Please use ... the latest version of GetWindowText! 2.) GetWindowsText from the Zip folder started? 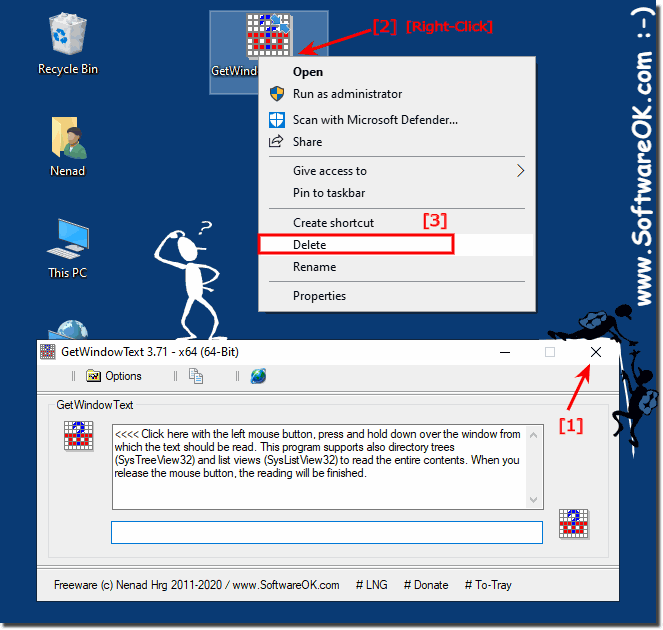 If you have started GetWindowsText from the Zip folder. It is probably in the "%TEMP%" folder in Microsoft-Windows File-Explorer. %TEMP% delete here the GetWindowsText.zip Folder! GetWindowText - FAQ-3: GetWindowText does not work, how can I uninstall it?